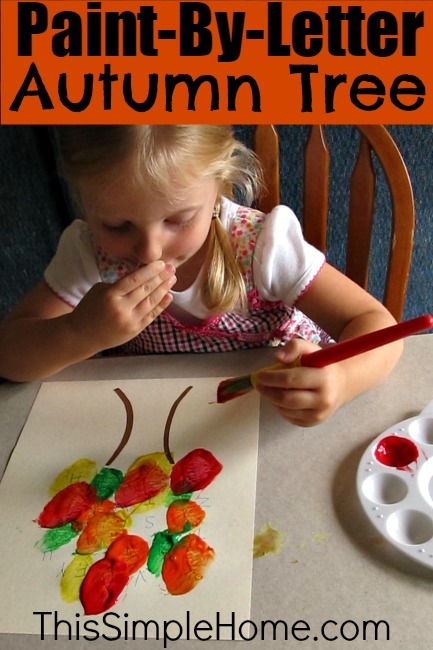 This fall tree painting provides preschoolers a fun way to work on letter recognition and the fine motor skill of using a paint brush while creating a beautiful autumn tree painting. Little Sister will be three this month. I recently realized she had not painted before...or at least not that I could recall. She didn't even know what paint was. We changed that. Since I love October and all of the fall colors I wanted to provide a way for Little Sister to paint a tree. 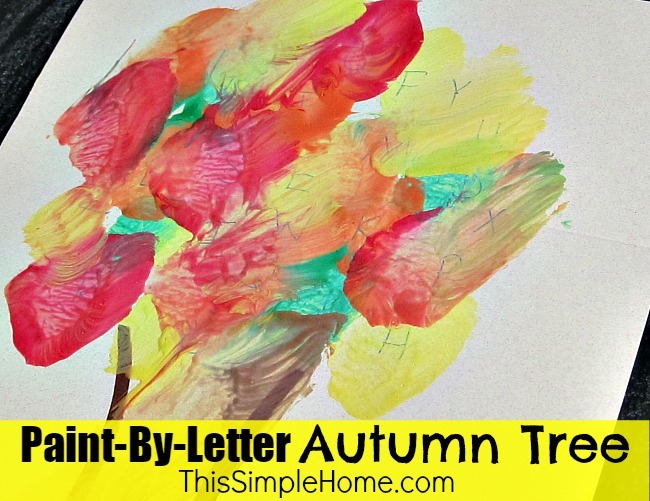 Inspired by this apple tree, I created a new fall tree, for her to paint-by-letter. First, I realized Little Sister needed practice painting. I wrote her name on a piece of paper. 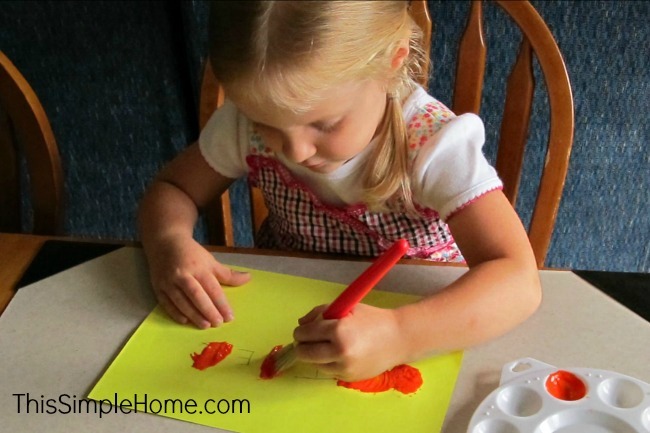 I provided her some paint and a paint brush, and then I asked her to paint each letter of her name. While she painted the letters of her name, I took a piece of paper and drew a simple tree trunk using a brown marker. Next, I wrote the letters of the alphabet in the area where the leaves. Place the letters in random locations. I provided her one color at a time. Begin with yellow for letters A-F. Orange for G-M, and so on. I began by asking her to find the A and paint it. We went through each of the letters. Mostly I prompted her which letter to find next. If I tried to help her find a letter (since I thought there were a few she would not know), she would say, "No, no, no." She wanted to do it herself. Once most of the letters were painted, I sometimes did need to help her since a letter might be partially covered by paint, making it harder for her to find. My apologies for not having a photo of the painting process before it was nearly covered with paint. I was having too much fun with my little girl. I loved how the colors blurred together on this fall tree craft. We used the colors red, yellow, orange, and green for the tree's leaves. Did you notice I did not draw the typical leaf outline? I wanted her to create her own with the paint. 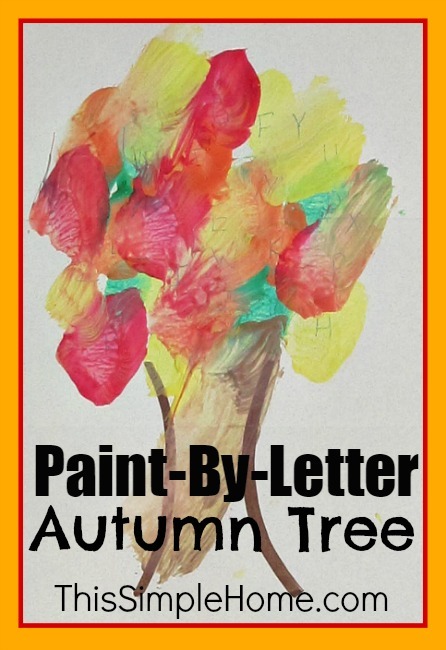 When she completed her paint-by-letter autumn tree's leaves, I mixed the green, red, and yellow together to create brown. Then she painted the trunk of the tree. She is very proud of her tree. She asked to paint more when we were done. I simply wrote her name again in bubble letters. She painted each of the letters. When it dried, we hung it on her bedroom door. If you like this craft, please look at our other children's crafts. I love this idea! Alphabet practice, plus a really nice painting! What a fun a creative idea! I love it and am sharing this one! I'm feeling the need to paint today, maybe we'll just do some random painting.